The Flecktarn KSK vest was originally designed as a field vest for special forces which was later issued to general infantry on foreign deployment. 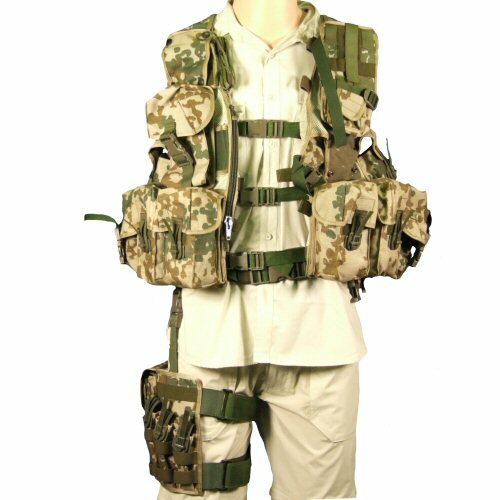 The vest is made in Germany as it is original equipment and comes as a full set, including detachable shoulder panels, shoulder utility pouch, triple grenade pouch, SEM 52 radio pouch, hip pad and holster. 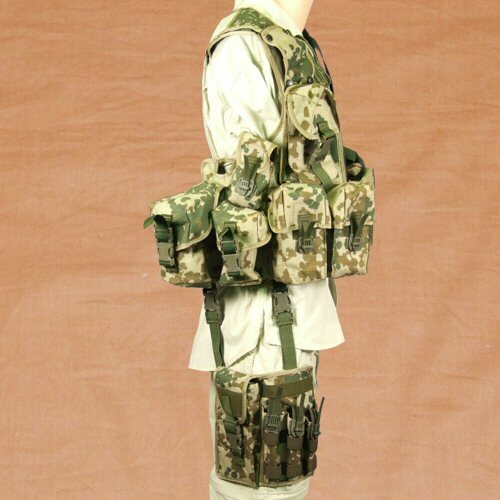 Mounted on double ply netting throughout, the vest is designed in such a way as to allow for maximum ventilation over the back and under the arms, with the top layer holding all the pouches being able to open just enough to maximise airflow underneath the pouches without compromising stability of the vest and load during manoeuvring. The vest's mounted pouches are located on the waist, and allow space for: two G3 or G36 (or three M16) magazines in each of the four ammo pockets, smoke grenade pouch located behind the ammo pouch array on left and right, utility pouch with button down flap to reduce profile when not in use located behind the smoke grenade pouches on left and right. There is a crossdraw holster located on the front left mid-level, with quick and easy access even with armour worn underneath the vest. On the front of the vest, two large zip dump pockets are located either side of the central closure. The vest additionally has two single grenade pouches which can double as double pistol mag pouches for standard mags which are located individually under either arm. The ammo and single grenade pouches open with the Spanish fly system and velcro, whereas the smoke grenade pouches and utility pouches open with adjustable quick release buckles. The Utility pouches are also fitted with a drawstring and toggle to enable the contents to be compressed into the pouch. All the ammo, utility and smoke grenade pouch lids are profiled to reduce ingress of damp and dust. 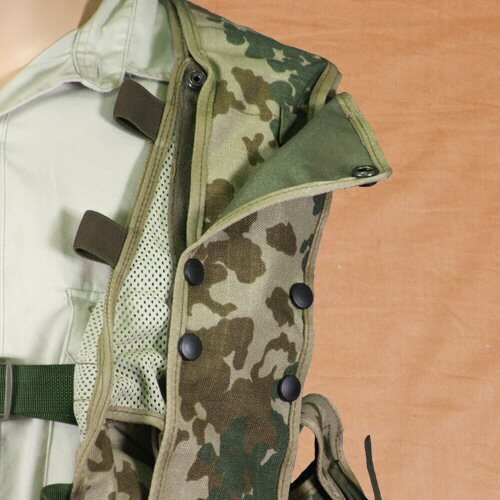 The vest is adjustable over the shoulders with extra long velcro and around the sides with three straps on quick release buckles on either side. The quick release buckles are a nice touch to allow the vest to be released quickly, but not accidentally in case of emergency. The front of the vest is closed with three adjustable quick release buckles. 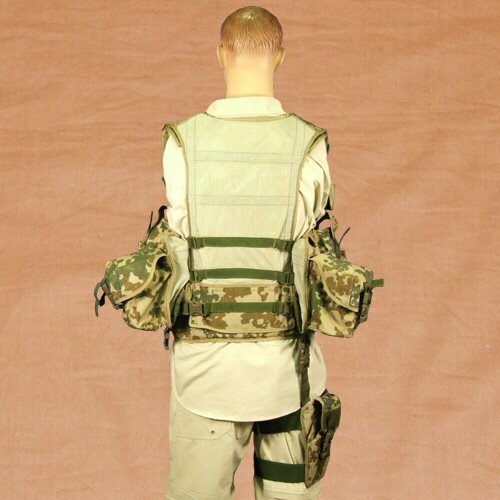 The additional pouches attach over the upper shoulders with velcro and push buttons and are mostly interchangeable, with panels to put in place if pouches are not required. 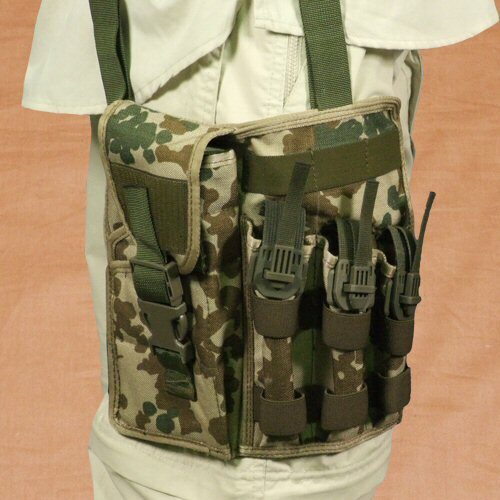 These are: triple grenade pouch with pocket for each individual grenade, shoulder utility pouch with capacity for three clipped together G36 magazines, SEM52 radio pouch. To help distribute load on the waist, a hip pad is included with the vest which is fully detachable and has its own quick release buckle. This can be threaded through the loops provided on the inside of the vest, and held in position via a velcro pad on the rear of the vest. A combination holster is also part of the issue pack which can take a USP or similar medium framed pistol, including LAM unit, as well as up to three standard magazines, or two standard and one high capacity magazine. This attaches onto a D-ring provided on the vest via thigh extension strap and around the leg with two adjustable straps on quick release buckles. The KSK multifunction vest is commonly seen worn with the KSK smock and trousers through such books as Reinhard Scholzen's KSK: Das Kommando Spezialkraefte der Bundeswehr. Available by special order in either standard Flecktarn or desert Flecktarn. Right side view of the vest showing the leg holster attached and all of the side pouches on the waist as well as one of the removable chest pockets. 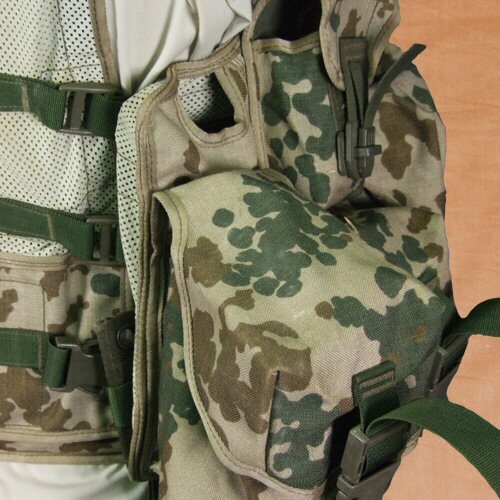 Close up view of the right rear of the vest, showing the utility pouch, grenade or pistol mag pouch and the ventilation hole just behind the armpit which is backed with mesh and faced with cordura. Close up view of the holster showing the holster which comes with three magazine pouches. Close up view of the shoulder panel showing the optional shoulder panel partially retracted. 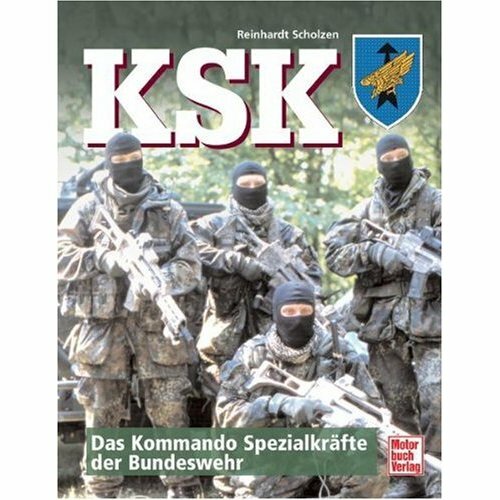 The vest is shown on the KSK personnel featured in Reinhard Scholzen's comprehensive KSK book.